This winter has been a bear for us … He’s got a new gig that requires a BART ride everyday, if not a bus ride too, exposing us to all kinds of hinkey new germs. That kinda got us down for a bit as we both struggled to acclimate and overcome. I’m positive the 2018 flu epidemic will go down in history as a doozie! The good news is, I’m finally feeling on the mend two months later (yeah, I got slammed with not just one but both flu’s eesh)! No matter if we are on the road or on the mend, I’ve found some beans are a great way to fuel up. Mixed with rice and some say you have a complete plant based protein, other say combining rice & beans just makes a satisfying meal. I developed this recipe myself after seeing a post that my son down south was cooking up his all time favorite meal I made as he was growing up “40 Clove Chicken”. 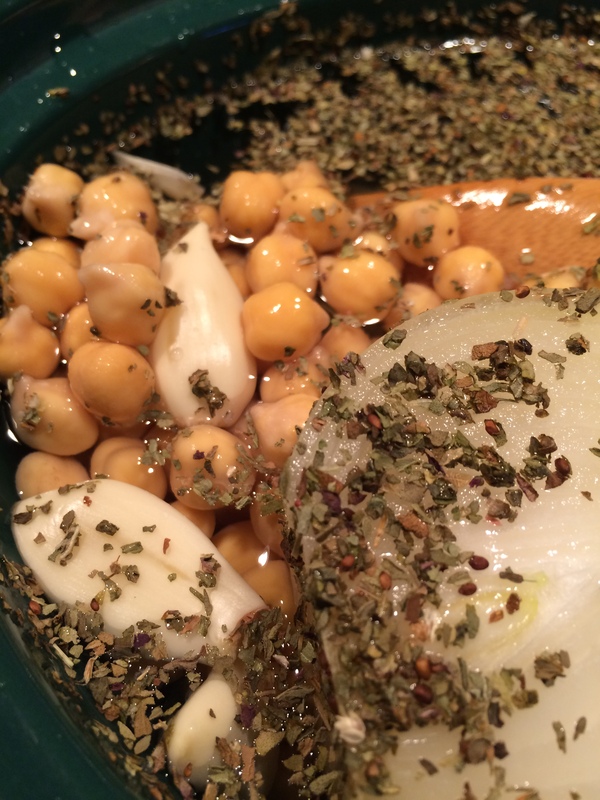 Realizing I missed the blend of spices and that sumptuous garlic flavor and thought, why can’t I do that with chickpeas? 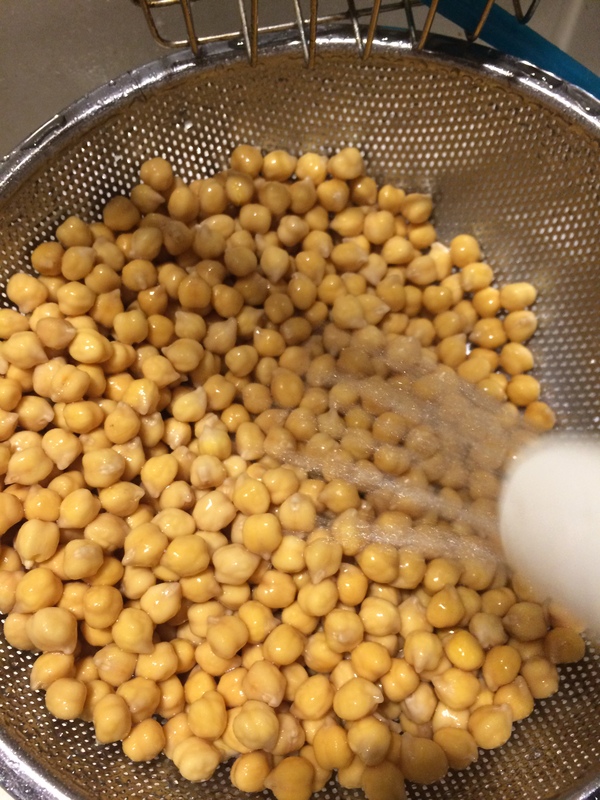 Start with One Pound of Chickpeas the night before! 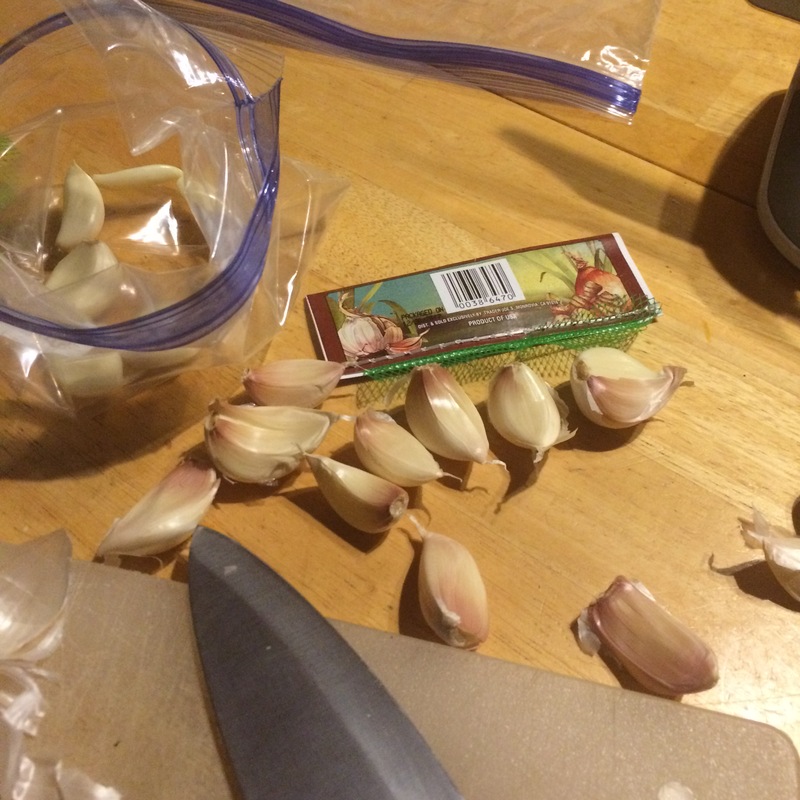 Rinse and Pick out the broken ones the night before, toss into a pot covered with water and let soak 12+ hours. 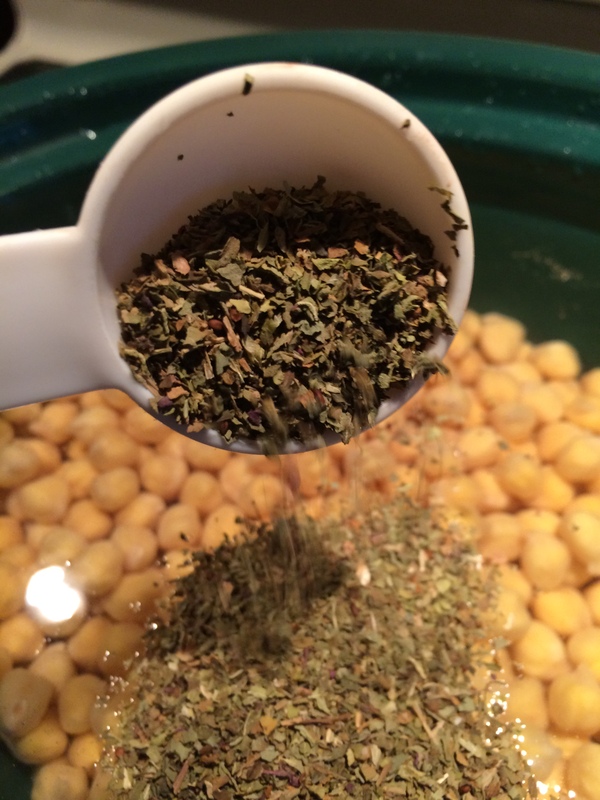 In the morning, strain your beans again in a colander then pick out the ones that broke during soaking. Rinse those beans well in nice cold clear water. 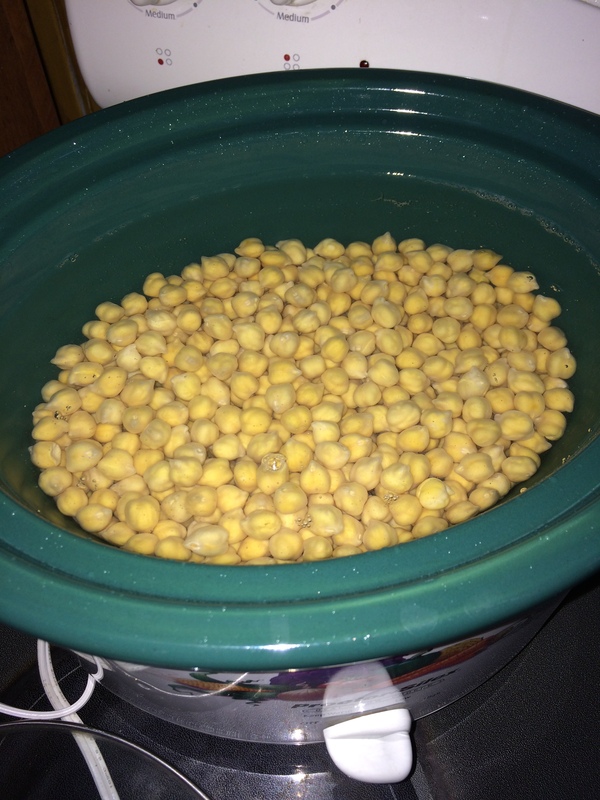 Throw your chickpeas into the slow cooker and cover with lots of fresh, cold water just almost filling — but leave some room. 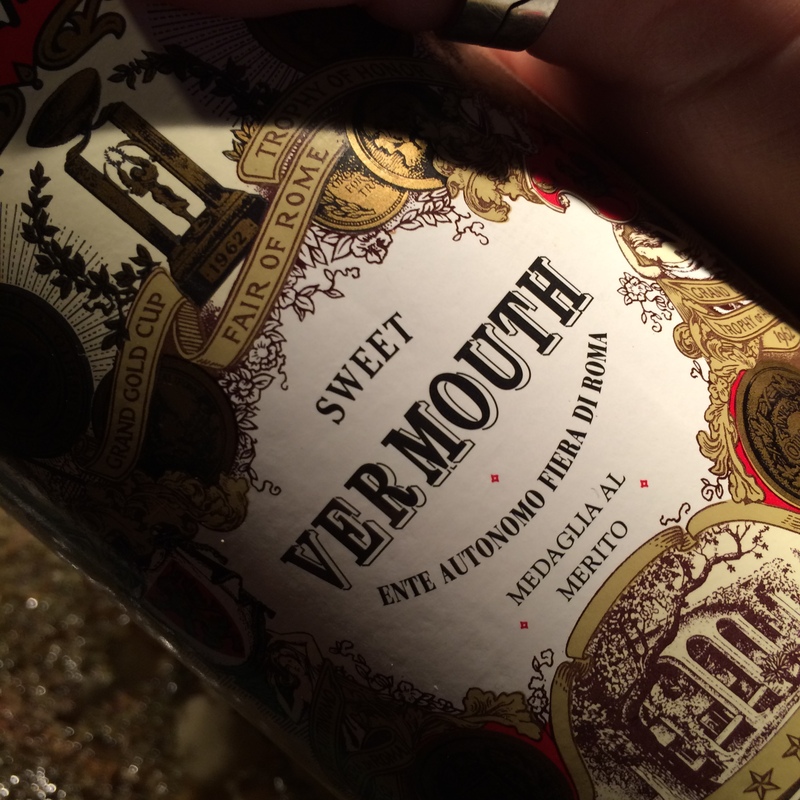 and (the secret sauce) a 1/2 cup of Sweet Vermouth. Cook on High Heat 2-3 hours, till the crock pot bubbles. Turn down to low for another 6 hours or so and remember to stir occasionally! Test the beans after 6 hours on low heat to see if they are soft to your taste, if not, let cook another hour or so. Now, you may find loads of broken beans if you follow my recipes — it’s my understanding that Salt helps to keep the beans from breaking apart, however, we like to adhere to a very low-sodium diet so I do not add any salt when cooking (I add a bit to taste on my plate). If you’d like to add salt to your dish add it after the cold water in the crock pot, string well, before you add your other ingredients. Drain the beans again in a colander once they are soft to your satisfaction…. don’t rinse these or you’ll loose all that yummy basil! 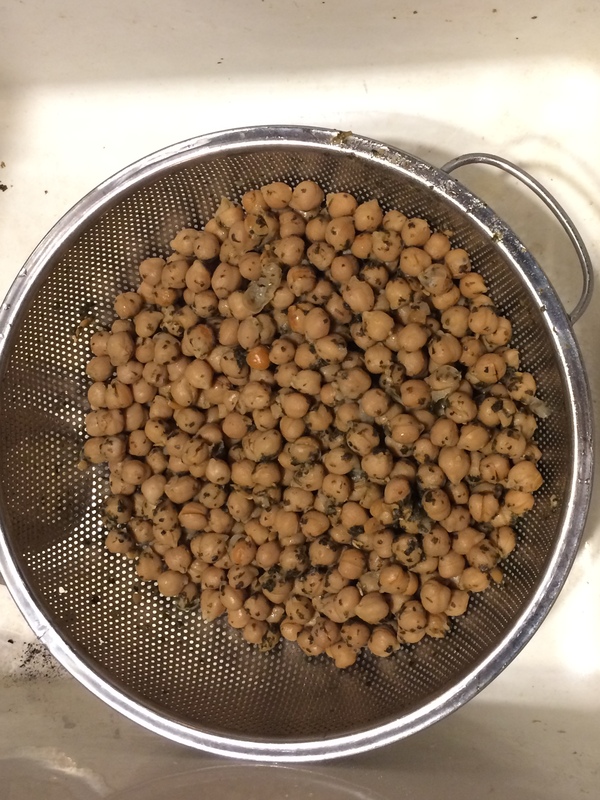 My trick for keeping beans more than a day or two: when they cool to room temperature (and dry somewhat) I spread them flat on a cookie sheet then freeze overnight. I can then package into a gallon bag for everyday eating or Food-saver vacuum seal smaller portions for longer storage or travel. 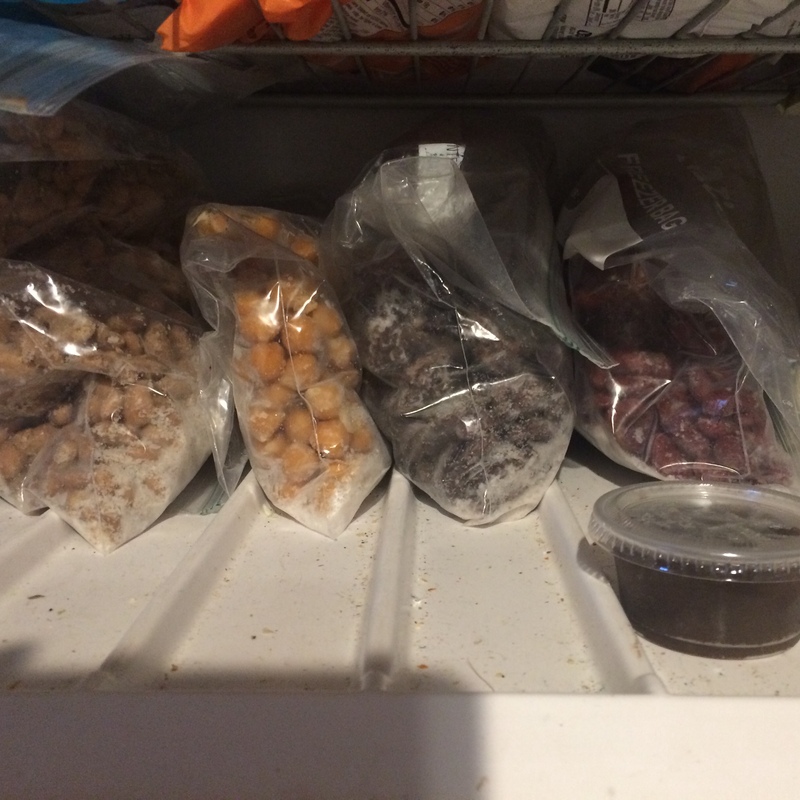 Pinto beans, garbanzo beans, black beans and red kidney beans frozen ready to heat & eat! Hope you give this recipe a go and let me know what you think!